The IDP (also known as the international driver's license) is based on the United Nations standards on Road Traffic. On September 19, 1949, the first Road Traffic Agreement was created and the United Nations established an International document to facilitate the travel of motorists in foreign countries where language barriers create difficulties for both, motorists and local officers. 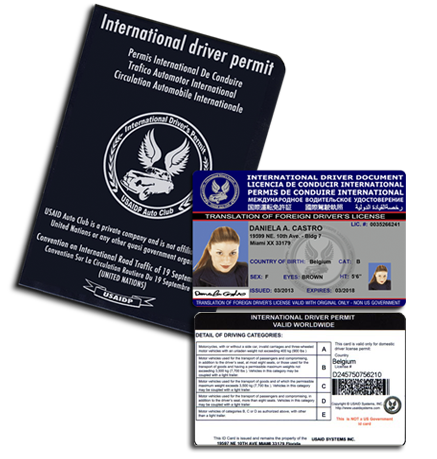 This document establishes the right for a person to drive in another country when accompanied by an original and valid driver's license, translating your driving permit in 9 languages. You need to fill out the IDP application form and put together a copy of current valid driver license, and color photo. This process can be easily entered online, with scanned Application, images of photo, driver license and signature in Jpeg format (the fastest way), or by regular mail. ustify. Your current valid domestic or national driving License, plus the additional application form information provides us the necessary information to translate your driver's license used in the IDP booklet and the non-government ID card. Your name, residence, vehicles category you allowed to drive and more information are translated in the IDP booklet in 9 languages: English, French, Spanish, Portuguese, Russian, German, Arabic, Japanese and Chinese. The complementary card, translates this information into English in the front. The PDF417 standard barcode in the back allows officer scanners all over the world easily read your personal details. How to use the document? - Driving as a tourist in any place of the world, you can present your current valid driver license, plus the International Driver's Permit (IDP Booklet plus the card) to make possible the understanding of your permit to any local authority. - This translation is valid until the expiration date, but it can't be used for more than a year in the same country, or once the driver establishes a residence there. If the driver lives or stays in a country, the motorist MUST apply for a local driving permit. (In accordance to laws and regulation). - The IDP is only a translation of a driver's license and not a regular driver's license. The IDP, without a currently valid driving License is not a useful or valid document to present to any authority. The IDP is designed to overcome the difficulties you might have while driving a vehicle in another country that may have different language than your own. This document is useful in many car rentals and local driving authorities for identification, motor vehicle registration or insurance proposes. You may return documents issued by USAID SYSTEMS, INC within 30 days of delivery for a full refund less $6.00 for S&H. Shipping cost is not refundable. Please note that we are unable to exchange items (However, If you received a damaged, defective, or incorrect item, please contact us immediately by phone or email). • Any item that is returned more than 30 days after delivery. please tell us, who gladly resolve any questions you have.. Please make sure that all given information is with accordance to the necessary requirements. There is NO REFUND for application that was send with the wrong information or expired / non valid original driver's license. Our translation has no official status and does not confer any legal privileges or rights on consumers. This is not an official document. IDP. Your current valid domestic or national driving License, plus the additional application form information provides us the necessary information to translate your driver's license used in the IDP booklet.